"I have repeatedly warned of the attempt by the British to land troops in Southeastern Europe, and I have said that this constitutes a threat to the German Reich. Unfortunately this warning went unheeded by the Yugoslav nation. I have further tried, always with the same patience, to convince Yugoslav statesmen of the absolute necessity for their cooperation with the German Reich for restoration of lasting peace and order within Yugoslavia." However after the Axis powers successfully conquered Yugoslavia with National Socialism , the Yugoslav Partisans who were backed, armed and supported by the Allied powers started resisting the Axis powers within Yugoslavia , thus leaving Germany no choice but to fight the partisans who took the side of the Allied powers. See http://en.wikipedia.org/wiki/Yugoslav_Front The following derisions were made at The Tehran Conference (codenamed Eureka) between Joseph Stalin, Franklin D. Roosevelt and Winston Churchill from 28 November to 1 December 1943. 1. The Partisans of Yugoslavia should be supported by supplies and equipment and also by commando operations. Between 1935 and 1939, Serbian-led Yugoslavia moved closer to Nazi Germany under the leadership of Milan Stojadinovic — a Serb politician who adopted the title “Vodja” (Fuhrer). As premier, he negotiated treaties with Germany’s help. He resigned in early 1939 and was replaced by Dragisa Cvetkovic, who continued to maintain a strong Serbian pro-Axis foreign policy. Events outside Yugoslavia now threatened to plunge the country into conflict. In April 1939, Italy invaded and occupied Albania, and by October 1940, Mussolini invaded Greece but found himself surrounded and almost defeated. To help his ally, Hitler ordered his General Staff to prepare an invasion of Greece, but soon he realized he needed transit rights through Yugoslavia. Serbian pro-Nazi Prince Paul had been willing to discuss a three-way, non-aggression treaty with Rome and Berlin to maintain Yugoslavia’s territorial integrity. He signed the Tripartite Pact with Hitler. The agreement originally signed in Berlin on 27 September 1940 between Germany, Japan and Italy formalized the Axis powers’ collaboration. On 25 March 1941, Serbian Prime Minister Cvetkovic and Foreign Minister Cincar Markovic also signed on this pact. Two days later, Serb military generals Bora Mirkovic and Dusan Simovic, led a British-assisted coup in Belgrade against the Cvetkovic government and placed Peter in charge, but the coup was unsuccessful because many Serbs viewed Jews and inhuman and blamed them for being “ancient enemies” of the Serbian people. Following the coup, Serbian Air Force General Simovic was quick to assure Berlin that Yugoslavia was “devoted to the maintenance of good and friendly relations with its neighbours the German Reich and the Kingdom of Italy.” He believed that his close friendship with several top Nazis, especially Luftwaffe chief Gorin, would save the day. 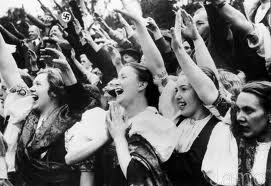 However, the Germans invaded on 6 April. The Serb-led army cowardly withdrew from Slovenia and Croatia to defend Serbia leaving the Croats and Slovenes without supplies or ammunition to defend themselves and causing anger among Croats who vowed to revenge for this type of humiliation. The Serbian-led Army quickly disintegrated. 100 of 135 Serbian generals in the officer corps surrendered during the first week. Belgrade was shamefully taken by a single platoon of Waffen-SS troops led by an inexperienced second-level German lieutenant on 12 April. Serbs simply gave up to fight. General Simovic and his government fled the country; the fighting was in the hands of Hitler by 17 April. In Serbia, a new pro-Nazi and viciously anti-Jewish government was first established under the leadership of Milan Asimovic and later under General Milan Nedic. Nedic supported Hitler and met with him in 1943. This new government immediately established three concentration camps for Jews, gypsies (Roma) and others. Nedic formed his own Serbian army in the service of Hitler’s Third Reich — known as the State Guard, which numbered 20,000 Serbs. The guard was comprised of former members of the Chetniks, which had existed as an all-Serb paramilitary police force under Alexander and Paul to enforce loyalty from non-Serbian members of the armed forces. The Chetniks were essentially a Nazi-collaborationist Serb nationalist guarrilla force, named after the armed irregulars who had harassed the Turks in the nineteenth century. The most important group were those organized by Colonel Draza Mihailovic in the Ravna Gora district of western Serbia. When Yugoslavia disintegrated, one faction of Chetniks swore allegiance to the new Serbian Nazi Government. Another group remained under the pre-war leader Kosta Pecanac, who openly collaborated with the Germans. 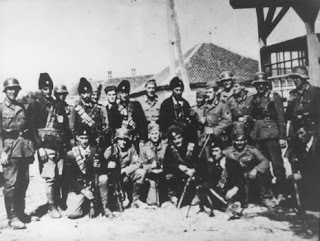 A third Chetnik faction followed the Serbian fascist Dimitrije Ljotic. Serbian Chetniks were primarily responsible for tracking down Jews, Bosnian Muslim, gypsies and (anti-fascist) partisans for execution or deportation to concentration camps. By August 1942, the Serbian Government would proudly announce that Belgrade was the first city in the new Order to be Judenfrei or “free of Jews.” Only 1115 of Belgrade’s 12,000 Jews would survive the war, and 95 percent of the total Jewish population of Serbia was exterminated between 1941 and 1945. Other Chetniks rallied behind Mihailovic, a 48-year-old army officer and monarchist who had been court-martialled by Nedic and was known to have close ties to Britain. Early in the war, Mihailovic offered some tepid resistance to the German forces while at the same time collaborating with the Italians. Although Mihailovic conducted a propaganda campaign to convince the Allies that his Chetniks were inflicting great damage on the Axis, he in fact collaborated with both the Germans and Italians while fighting the Ustase and (anti-fascist) partisans. At its peak, Mihailovic’s Chetniks claimed to have 300,000 troops, but in reality, they never exceeded 30,000. At first, the Allies considered Mihailovic the most important figure in the Yugoslav resistance because he offered some tepid — almost non-existent — resistance to Germans in 1941, but after learning that Mihailovic was openly collaborating with Axis powers, the Allies eventually shifted their support to the partisans led by Croat Josip Broz Tito. The partisans represented the only real resistance to the Axis in Yugoslavia during World War II. They fought a tenacious campaign; and on 13 July 1943, a Democratic Republic of Croatia under the leadership of Andrija Hebrang was declared in those areas occupied by partisan forces. By the end of 1943, the partisans numbered 300,000. No reliable data exists as to the precise ethnic make up of partisans. In World War II, majority of Bosniaks (then Bosnian Muslims) joined the ranks of Marshal Tito’s partisans, but they were mistakenly regarded to be ethnic “Serbs” or ethnic “Croats,” due to Yugoslav authorities’ refusal to recognize them as a distinct ethnic group. It is presently estimated that the ethnic makeup of partisans in the occuped Bosnia-Herzegovina, up until October 1944, consisted of 70 percent Bosniak-Muslims, 22 percent Serbs, 6 percent Croats and 2 percent ‘Others’ (Roma, Jews, etc). It was only after the defeat of the Nazis in the occupied Yugoslavia and the overthrow of Nedic’s collaborationist regime in October 1944 that the Serbs in Serbia began to join the partisans in large numbers. They were responding to Marshal Tito’s promises of amnesty. Now former Nazi collaborators — the Serbs who supported Hitler and participated in the Holocaust of Jews and Bosnian Muslims — would form the majority of Tito’s anti-fascist fighters and enjoy the amnesty from war crimes prosecution. "The fight on Greek soil is not a battle against the Greek people, but against that arch-enemy, England . However Jews in Greece led the resistance movement against the Nazis and collaborated with the English against Nazi Germany"
However within Greece there were was a large Jewish community. Up to 100 000 Jewish-Greeks lived in Greece at the time WW 2 broke out. 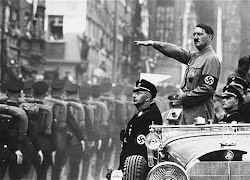 Judea declared war on Germany in 1933 therefore majority of Jews around the world had already declared war on Germany. 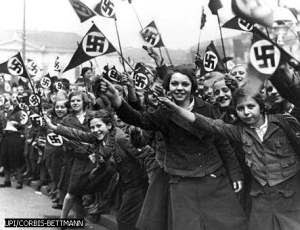 With Hitler's Anti-Semitic policies of the National Socialist's this was even more of a reason for Jews worldwide to resist Nazi-Germany in country's that they lived in . Greece was no exception. Jewish-Greek military leaders such as Colonel Mordechai Frizis collaborated with the English Allied powers to side with them against Nazi Germany in order to secure their future in these country's, as National Socialism would have not guaranteed the survival of Jews in these country's such as Greece. Socialist Federal Republic of Yugoslavia? Who was responsible for inciting the Serb/Bosnian civil war in the Balkans where over 220,000 Bosnians were massacred ?Who was responsible for the NATO bombing and destruction of Serbia in 1999? Who was responsible for the illegal creation of Kosovo as an independent Albanian country when it rightfully belonged to Serbia and was a province of hers for hundreds of years prior to mass Albanian immigration. I am afraid the destruction of the Balkans came from the same Allied powers that the Yugoslav Partisans fought for in WW 2, NOT Axis powers who they were "resisting".